Amathus Beach Hotel brings guests a luxury experience at every turn. This coastal resort strives to offer its guests the most relaxing stay possible by providing exceptional rooms, plenty of convenient facilities and a stunning location. It’s a great family-friendly hotel as well as being a great romantic getaway for couples. Accommodation at Amathus Beach Hotel is finely furnished with delicate colours that accentuate the luxury feel of this hotel. You’ll never be bored here as adults and children alike have a large variety of ways to stay entertained, from evening shows with live music to the Amathus Spa, from an impressive array of water sports on offer to the simple pleasures of the indoor and outdoor pools and great children’s programmes and playground. There are a large choice of restaurants that serve fine international and traditional cuisine as well as several incredible bars and that’s without mentioning all the options outside of Amathus Beach Hotel. 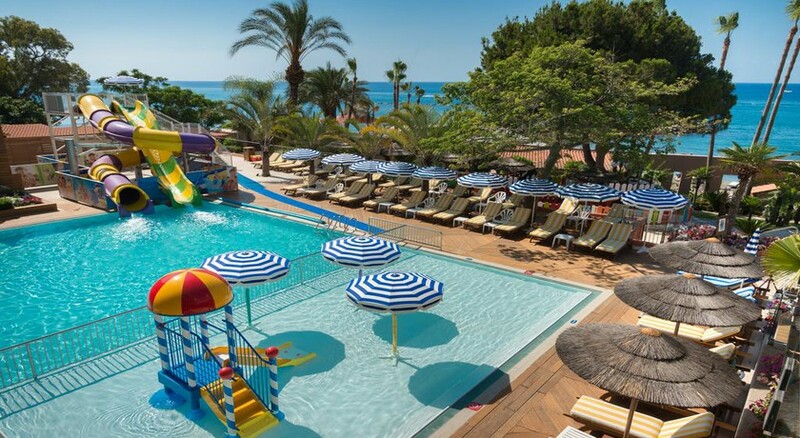 Amathus Beach Hotel sits conveniently at the midway point between Cyprus’s two main airports; both Larnaca International and Paphos International are 40 minutes. 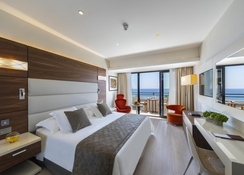 Located on the edge of the Cypriot coast, Amathus Beach Hotel is just 10 minutes from Limassol’s city centre, providing easy access to all conveniences such as retail shopping, tourist information as well as a diverse selection of restaurants and bars. 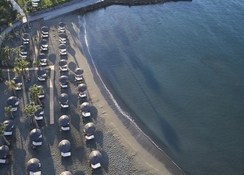 Its location on the beachfront means you can be relaxing under the golden Mediterranean sun in no time. Guests will be treated to a luxurious stay with exceptional comfort and stunning interior design combining to provide guests with a memorable holiday. Amathus Beach Hotel has all the essential amenities you’ll need for during your time here such as wi-fi, private bathroom, T.V., in addition, every guest will also receive their own pair of slippers and extra soft bathrobe. There are several rooms types to choose from. Superior rooms sleep up to three adults or two adults and one child and are spacious and well-appointed. Family rooms afford guests a little more space for extra guests as they sleep two adults and up to four children. For something extra special you might want to check out the Junior Suite with Private Pool or go all out with the Presidential Suite. The luxury experience continues with the great food and drink offerings at the Amathus Beach Hotel. In-fact there are so many you may not have to step outside of your hotel. The fine-dining experiences to be found here include the Limanaki Fish Restaurant serving the freshest Mediterranean seafood, Kalypso Restaurant, the main Restaurant is open for breakfast, lunch and dinner and caters to both international and local tastes. Authentic Mediterranean cuisine and stunning views come together at the Vivaldi and delicious Cantonese at the Seasons Oriental. If you’re just looking relax with a drink under the Cypriot sun or moon then take your pick from no fewer than five bars all with an excellent selection of drinks and al fresco dining. 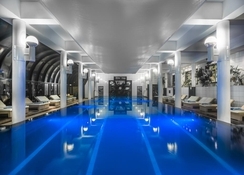 At Amathus Beach Hotel there’s an almost endless array of activities. Make the most of your stunning coastal location and hit the water where you can enjoy jet skiing, canoeing, water skiing and more besides. Relax in one of the hot tubs or jacuzzis, or recuperate and restore your body with a hydrotherapy bath, mud wrap or aromatherapy. Children will love the playground and entertainment at the Pelikan Kids Club. Head into the town of the hotel’s namesake and check out the stunning ancient sites of Amathus with its medieval castle, archaeological sites and old port.